The Czech Republic is a student paradise, with cheap beer and plenty of hostels,it’s clear to see why every summer the place is teeming with backpackers. However, I find it a great shame that what brings many students to Czech Republic is the nightlife and nothing more. As someone who doesn’t regularly drink, I want to let everyone know what lies outside of five–room nightclubs and jelly shots. 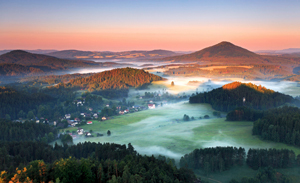 The main purpose of my journey was to go to a camp in “Bohemian Switzerland”, which lies by the Elbe Sandstone Mountains, near Děčín. It is around two hours from Prague, and the train ride alone makes it all worthwhile. The train follows the Elbe River, and the view is utterly breath taking. With the wide river and dense forest, it feels less like Switzerland and more like a journey into the heart of the jungle. The train itself is worth mentioning, as it is so radically different from travelling by noiseless, modern trains. Instead, you have the individual wooden cabins and the track rattling beneath you in a charmingly old-fashioned way. There is no greater pleasure than opening the cabin windows wide and feeling the fresh air blast against your face. Listen to the train pounding the tracks and gulp in the fresh, open countryside that makes such a refreshing change from the cramped cobbled streets of Prague. After the gorgeous train journey, my destination was Děčín. As you get close to the station entering the city, you should look out for the castle, you can’t miss it. The castle is steeped in history, playing host to everyone from Bohemian Kings to Soviet Troops.After a 10 hour journey we were far to tired to enojy much of what Děčín has to offer, which is a shame. Our camp, Intercamp U Ferdinanda, couldn’t be in a more ideal location; surrounded by forest, vast rock formations and a rocky river to ruin your feet in. They speak little English there, but relatively good German, so it might be useful to brush up on your high school language lessons. One thing I noticed is that Czech cuisine isn’t for vegetarians, or the smaller appetite. More than once I saw a menu item that was basically a pile of meat smothered in cheese, and always in huge portions. I took a special liking to the Pork Knuckle with potato or bread dumplings and sauerkraut - which is technically a German dish but found almost everywhere. Wash it down with a dark beer in the sun and a plate of Palachinka - although I can’t explain why the latter is different from your average crepe. After time spent hiking and escaping the real world, I went to Prague. It was my first time there, and not my last. I’d confidently say it is the most beautiful city I have been to so far. Prague has more charm than places like Copenhagen or Paris, with its packed little side streets and very few modern business buildings ruining the skyline. However, it can get very packed, making you feel more like cattle. So whilst Prague is a beautiful city with an amazing history, try visiting elsewhere in the Czech Republic, rather than seeing it as a pit-stop before Budapest, or a messy weekend trip with your mates.